[:en]Well even with lots of exams I decided to be on this challenge. I’ll only make 5 a week and that’s a great goal for me. Almost every morning (I wake up earlier) and during lunch I’ve been working on the cards, it’s a great way to relax a little bit. I only found this kind of cards (not the regular index cards) but I think I’m not breaking the rules! 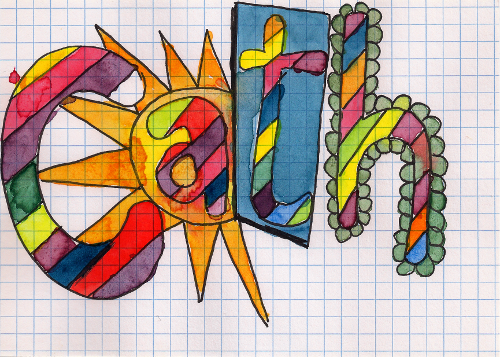 Doodling my name, love the colors! Making a grid out of receipts. This one looks a little weird because I had to edit the color since my scanner got it all wrong! But don’t you agree that yellow is such a happy color? Love the simplicity of the dragonfly with a touch of watercolor in the background. About my exams…my first exam didn’t go well so all my motivation to study is pretty much gone. I need to find it somewhere ASAP. [:pt]Bem mesmo com muitos exames decidi participar neste desafio. Irei apenas fazer 5 por semana e acho que é um bom objectivo para mim. Quase todas as manhãs (eu acordo mais cedo) e durante o almoço tenho trabalho um bocadinho nestes cartões, é uma óptima forma de relaxar um pouco! Encontrei apenas estes cartões (não os normais) mas acho que não estou a violar as regras! A desenhar o meu nome, adoro as cores! Fazer uma grelha com talões de compra. Este está um bocadinho estranho porque o scanner pôs-lo com uma cor super esquisita e tive de andar a editar bastante a imagem! Mas não concordam que o amarelo é uma cor feliz? Adoro a simplicidade da libélula com um bocadinho de aguarela no fundo. Fabulous idea with the receipts! great index cards! As for studying…umm…just not sure about that. One of my favorite quotes is: Live like you’ll die tomorrow, learn like you’ll live forever. Good luck with the studying, you won’t be sorry you did it! Great cards! My favorite is the dragonfly!